I love straight talk when it comes to things that we just need to know. Okay. If we're talking about finances  then I suppose it depends on what you consider "affordable" to be. What is a heap of money to one individual may in fact be pocket change to another. So instead let's just talk turkey. This article gets into the details of cheap liposuction  like average cost, how to afford liposuction, and how to stay safe in the process of having your liposuction surgery. Is there such a thing as affordable liposuction? Hopefully your answer is a wise mixture of caution and hopefulness. When evaluating if affordable liposuction is possible - you must consider your specific circumstances. We know that plastic surgery is no longer just for the rich. Many working class folks are mortgaging the house and leveraging what few resources they have to obtain the services of plastic surgeons around the world. It is simple. Plastic surgery and the results thereof are most often temporary. You should be prepared to replace, redo, correct, and maintain your new look. If you can't afford  or can barely afford the initial surgery  you may be setting yourself up for a situation that will threaten your health long-term. And you won't have the means to comfortably correct or address the situation. And please don't rely on insurance to help you pay for your surgery. There are very few instances where insurance will help defray the cost of cosmetic surgery. In most cases you will foot the entire cost... even for corrective procedures of plastic surgery gone bad. Again the typical cost of affordable liposuction will range from about $3000 to $4000. But this is highly dependent on what you wanting to accomplish. If you want many different areas of your body addressed during a single surgery you will pay more. How much money can I save by bargain shopping for liposuction? Good question. The answer is - however... "It depends." Overseas surgery may save you hundreds or thousands of dollars up front. But depending on what transpires during that surgery  you may have to pay to have shoddy work corrected. Or you may have to pay for follow-up care at home due to complications... You risk paying more in the long run when you take a chance overseas with an unknown doctor with no verifiable track record. Bad surgery can and does happen in the United States as well. So your best bet is not to focus on how much you can save  but on how reliable and well-trained your physician is. What are the ways in which I can afford my liposuction surgery? #1 Affordable Liposuction Tip  Always ask for the discount. Research has shown that women get worse deals across the board  for the simple fact that we won't ask for the discount. And one of the main reasons is that we don't want to insult another person by asking them for a savings. Followed closely on its heels - would be a paralyzing fear of embarrassment. Both of these emotions  if left unchallenged  lead us firmly down the path of low self-worth. Think of what it costs you to earn money. All of the sacrifices that you make... All of the cranky people you tolerate... The sweat, blood and tears you shed - just to provide a living for yourself and your family. Honor that effort by making sure you get the best value for your money. Always ask for a discount. Make it your new default position  and you will be pleasantly surprised by how much more your dollars are able to accomplish. #2 Affordable Liposuction Tip  Get it done right the first time. Part of affordable liposuction is not spending twice for a single procedure. This is really a no-brainer. If your surgeon does poor work the first time around  you will spend much more money having it fixed. Achieving affordable liposuction is possible. But you have to take some things into consideration. Always ask for the discount because there are no sacred bargain-free zones anymore. Everything and anything can be negotiated. Don't sit on the side-lines in this regard. Get in there and ask away. You will most likely surprise yourself with unexpected savings. The second  and possibly more important take-home here  is that you should view the high-level skill set of your surgeon as a part of affordable liposuction in the long run. Pay the extra for a terrific and experienced surgeon up front. You will save yourself potential misery and ultimately money. 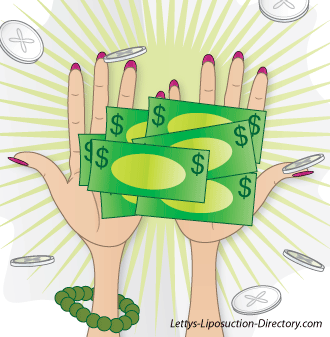 Don't have cash for liposuction?.. Try plastic surgery credit card financing. "Lipotourism puts US citizens at risk for M abscessus infections." Infections in Medicine 25.6 (2008): 299. General OneFile. Web. 23 Jan. 2010. In Summary: Whether you're looking for affordable liposuction, cheap liposuction, liposuction savings, or cheap lipo - Letty's Liposuction Directory is your up-to-date source for terrific liposuction information... AND above all else - we are completely committed to your health and safety. Please read our complete Medical Disclaimer here.